A small pocket of Western Australia’s remote outback is set to become the eye on the sky and could potentially save the world billions of dollars. The Murchison Widefield Array (MWA) radio telescope, unveiled today, Friday 30 November, will give the world a dramatically improved view of the Sun and provide early warning to prevent damage to communication satellites, electric power grids and GPS navigation systems. The $51 million low-frequency radio telescope will be able to detect and monitor massive solar storms, such as the one that cut power to six million people in Canada in 1989 during the last peak in solar activity. 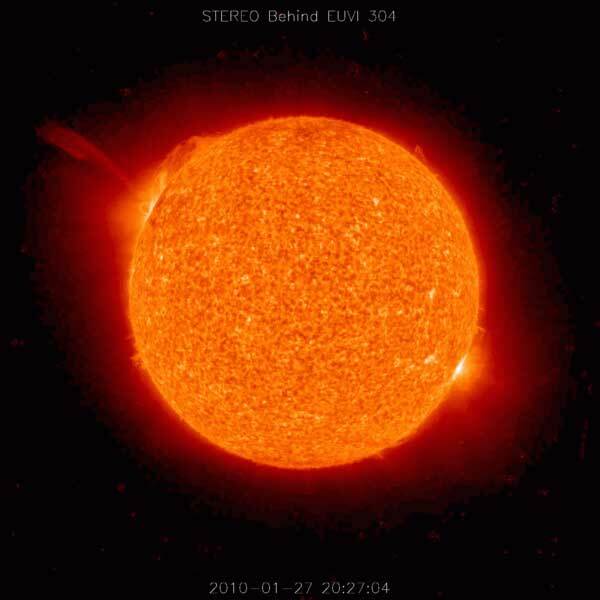 In 2011, experts warned that a major solar storm could result in damage to integral power supplies and communication networks of up to US$2 trillion – the equivalent of a global Hurricane Katrina. The MWA will aim to identify the trajectory of solar storms, quadrupling the warning period currently provided by near-Earth satellites. This is timely as the Sun is due to re-enter peak activity in 2013, with a dramatic increase in the number and severity of solar storms expected, with the potential to disrupt global communications and ground commercial airlines. The completion of the MWA realises eight years of work by an international consortium of 13 institutions across four countries (Australia, USA, India and New Zealand), led by Curtin University. The Murchison Radio-astronomy Observatory (MRO: operated by CSIRO) was chosen by the consortium because it is the world’s best location for low frequency radio astronomy. The site has also been selected as the future home for a major part of the Square Kilometre Array. The MWA is ground-breaking in other ways too – it will offer scientists an unprecedented view of the entire history of the Universe, to gain a better understanding of how the early Universe formed and the relationship between gravity and dark matter evolved, including how the very first stars and galaxies formed. “Understanding how the dramatic transformation took place soon after the Big Bang, over 13 billion years ago, is the final frontier for astrophysicists like me. It has taken eight years to get to this point and it is incredibly exciting to have completed construction and to be collecting scientific data from the MWA,” Professor Tingay said. “Preliminary testing, using only a fraction of the MWA’s capability, has already achieved results that are on par with the best results ever achieved in the search for the first stars and galaxies. “We anticipate a 10-fold improvement in performance when the full capabilities of the MWA are pressed into service in early 2013,” Professor Tingay told a group of eminent scientists and VIPs who had travelled from all over the world to attend the telescope’s unveiling. “With it we will, for the first time, be able to look at the transformation of the Universe from a rather boring environment of hydrogen and helium to the point where the stars, galaxies, and black holes create the vibrant Universe as we know it,” Professor Schmidt said. The Murchison Widefield Array will have four primary areas of scientific investigation; as well as looking back into the time to the early Universe, soon after the Big Bang, and its in-depth study of the Sun – Earth connection, the data produced by the telescope will also be used to better understand our galaxy and distant galaxies, as well as violent and explosive phenomena in the Universe. The MWA has been supported by both State and Federal Government funding, with the majority of federal funding administered by Astronomy Australia Limited. The MWA project recognises the Wadjarri Yamatji people as the traditional owners of the site on which the MWA is built and thanks the Wadjarri Yamatji people for their support. Located 370 km north-east of Geraldton (nearly 800 km from Perth) the MWA is situated in the Shire of Murchison, an area of approximately 50,000 square kilometres (19,300 square miles) and has a population of 114 people. The MWA is located at CSIRO’s Murchison Radio-astronomy Observatory (MRO). The Murchison Widefield Array will pick up radio waves that have travelled between 8 minutes (the Sun) and more than 13 billion years (soon after the Big Bang) to reach Earth. The telescope spans a 3 diameter kilometre area and is entirely static (no moving parts). It uses 2,048 dual-polarisation dipole antennas arranged into a strategic formation of 128 groups (16 dual-polarisation dipoles per group). Each of these antennas has been constructed from a flat-pack style design and built in-situ at the MRO by a team of undergraduate students from Curtin University, known as the Student Army. The telescope is considered low-cost, with each antenna costing approximately $3,000. Comparatively a high frequency dish telescope costs in the region of $500,000. Radio waves collected from the sky are digitised, producing a new image of the sky every few seconds. These are then sent via high speed optical fibre, an early part of the National Broadband Network, to a processing and archiving facility over 700 kilometres away in Perth (the $80m Pawsey HPC Centre for SKA Science). When operating at full capacity the telescope will produce the equivalent of a 2 hour long HD movie every 10 seconds (approximately 4 GB every 10 seconds). Technology giants IBM and Cisco, as well as Western Australian based firm Poseidon Scientific Instruments (acquired by Raytheon in July 2012), have worked with the consortium to create highly specialised hardware to process the vast amount of data created by the telescope. The primary archiving facility will be the $80million Pawsey HPC Centre for SKA Science, which is being built in Perth. Information is also being automatically transferred to MWA partner organisations in Boston in the United States (MIT) and Wellington in New Zealand (Victoria University of Wellington). It takes storms around 20 hours to travel from the Sun into the Earth’s heliosphere. Satellites can provide – at best – two to three hours’ notice. The Murchison Widefield Array will be able to identify solar activity within a matter of hours. This early warning provides an increased opportunity to mitigate damage by moving satellites out of the direct line of debris. But useless for seeing storms developing on the far side of the Sun, or during the Australian night.